Harbord Village laneways are named to honour past residents and reflect the diverse nature of the neighbourhood. As proposed by current residents, the names include those of a few famous people, several local activists, and some of the working people who have lived here. The entire Jackson family had reached freedom…Albert Jackson grew up to become the first African Canadian postal worker in the city, and his appointment caused some friction because it elevated a black man over white postal workers in lesser positions such as mail sorting. Albert was kept as an inside worker, despite being hired as a postman to deliver mail, until the people of St. John’s Ward launched a public inquiry. Eventually Albert was assigned to deliver mail rather than simply sort it at the post office. Albert Jackson’s name was suggested for this laneway by Patrick Crean, publisher of I’ve Got a Home in Gloryland. He subsequently discovered, to his astonishment, that he and his wife, the novelist Susan Swan, were living in the Jackson house on Brunswick Avenue. 16: Boys of Major Lane memorializes several young men of Major Street who fought in the Second World War, at least four losing their lives. They spent their youth in the city playgrounds, Jewish immigrant kids too poor to afford a bat and ball, never dreaming they’d own a baseball mitt. These boys were among the earliest to enlist, some lying about their age, 17-year-olds going to war. Harold Fromstein, known as Red, lived at 117 Major St. He used his older brother’s name to enlist in 1940. Wounded in France in 1944, and decorated for his service, he survived the war. Joe Greenberg enlisted in the Royal Canadian Air Force in 1940 and survived the war to become the legendary Dr. Joe Greenberg. Flying Officer Irving “Porky” Lindzon was shot down over the Bay of Bengal in 1945. Flight Sgt. Harold Sobel lived at 5 Major St. and Flight Sgt. Solomon (Solly) Kay next door at 3 Major St. The two were friends and competitors, pitching against each other in rival baseball teams at the Lord Lansdowne playground. They formed a club and carried their membership cards as good luck charms. A third friend, Charles (Chucky) Males, joined them in the air force. None returned from the war. Joe and Murray Sonshine also served. Murray died; Joe was taken prisoner and sent to Buchenwald, though he did survive. This selection of media stories outlines how and why the names were chosen, and shows the community celebrating at naming ceremonies. 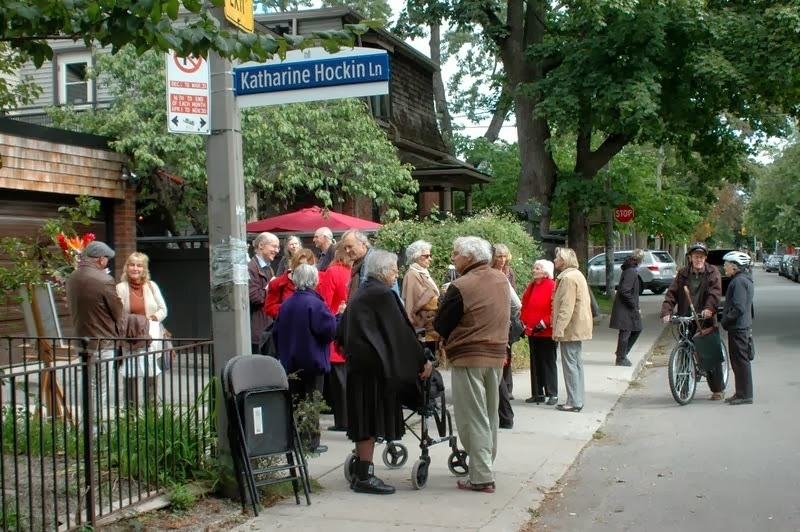 Naming ceremony for Katharine Hockin Lane. Photo by CCS Online.